The Central Gardens Annual Meeting brings neighborhood residents together to enjoy refreshments and presentations by members of the Central Gardens Association Board of Directors. This meeting offers information to residents as well as a forum for questions of interest to the community. This meeting is open to everyone in the neighborhood. Most importantly, the meeting provides an opportunity for neighbors to engage with each other. The meeting is held on the first Monday in May. The Central Gardens Association held its Annual Meeting on May 14. Approximately 150 residents of Central Gardens were in attendance at the beautiful new home of Ballet Memphis in Overton Square for refreshments prior to the annual meeting and to mingle with the Central Gardens Board. Community support organizations, like Phelps Security, Memphis Heritage, Explore Bike Share and members of the Fire Department were on hand to provide information about their services and resources. 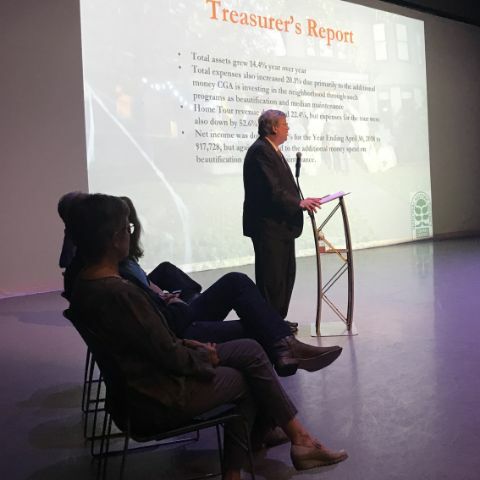 Kathy Ferguson, who served as the President of the Central Gardens Board for the past year, gave a quick overview of the efforts of the board on behalf of the neighborhood. A key development for the board and for the neighborhood this year, was the addition of part time Program Manager Nancy Knight, who helps the board accomplish its goals, apply for applicable funds, and generally run more smoothly. Additionally, Eddie Hutchison was elected board president for the upcoming year. Mark Fleischer will serve as vice president. The overview included the accomplishments the three core pillars: Green Space and Infrastructure (Median cleanups, Sidewalk replacements, Holiday Wreaths, Perimeter signage, and maintaining Arboretum status); Midtown Relationships (working with other neighborhood associations including Cooper Young, upholding Landmark protections, exploring a Security Camera system, and Architectural Guidelines); and Community Relationships (Firehouse fundraiser, Home Tour, July 4th Parade, National Night Out, St. Jude Marathon, Block Parties). The guest speaker was Mayor Jim Strickland, who spoke of his days as a Central Gardens resident and getting married at the Cathedral of the Immaculate Conception. Mayor Strickland spoke on the challenges of population loss but was optimistic, citing the great momentum he sees in Memphis. Other notable guests included David Lenoir, Reginald Milton and Worth Morgan.